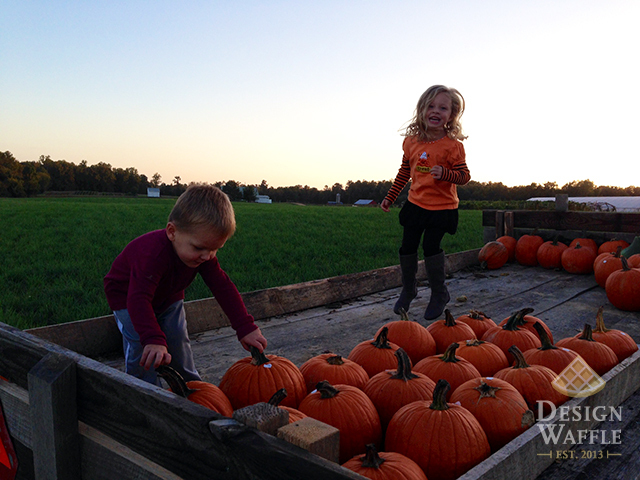 It all started with a visit to the pumpkin patch with my niece and nephew. They chased little kittens, continuously swapped their pumpkins out for a bigger one and ran wild through the field. After telling them they each get “one” pumpkin, we left with a trunk full. I’d say they each ended up with about 4 or so. Oh well. What are aunts for, right? As for the decorating, this year I decided to do something different with my pumpkins. I knew I wanted a metallic, chrome look but I wasn’t quite sure how to achieve it without using paint. I tried hot gluing sequins and after about 10 sequins, they started falling off. So then I got the idea to use aluminum foil. And it actually worked… pretty well I’d say. I used the heart hole punch obviously for the heart pumpkin and then used the spray adhesive to spray the little cutouts. 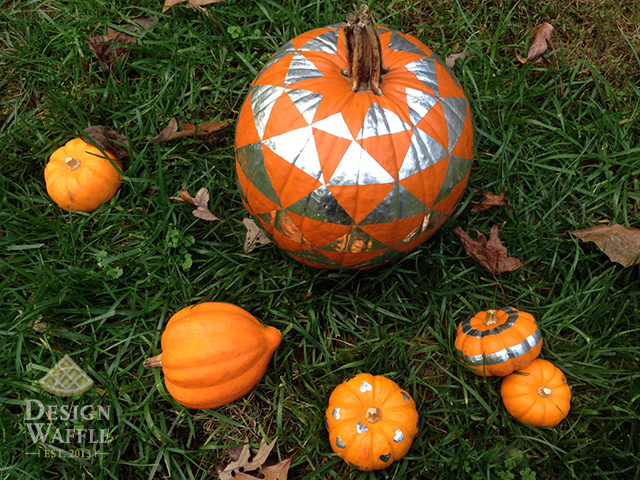 I used a pencil to rub the foil flat, burnishing it onto the pumpkin. For the striped one, I used the rotary cutter and fabric ruler over the self healing mat to cut strips. 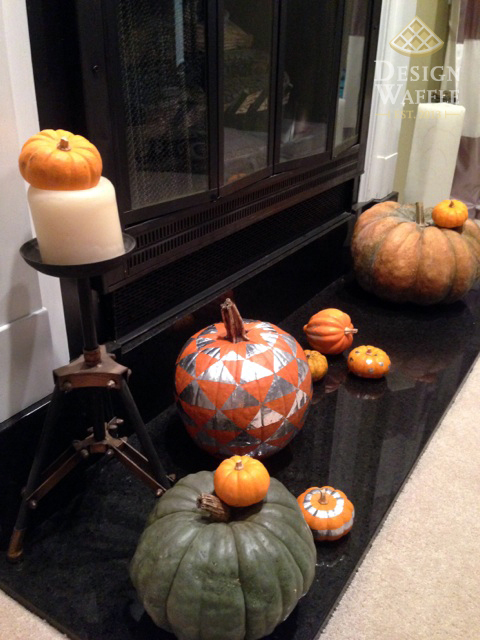 The triangle pattern pumpkin was the same as the strips, but I trimmed them into triangles. 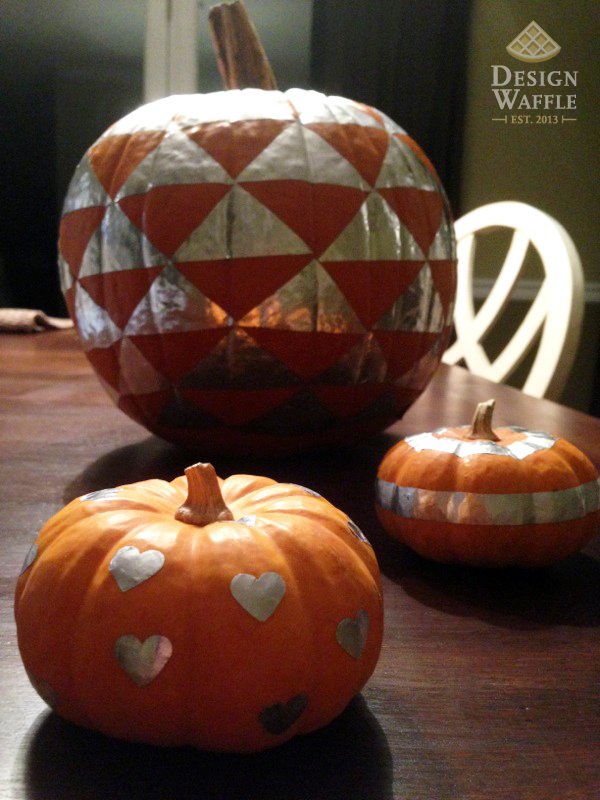 The pattern got a little funky since the pumpkin isn’t flat, so I ended up using random sized triangles. 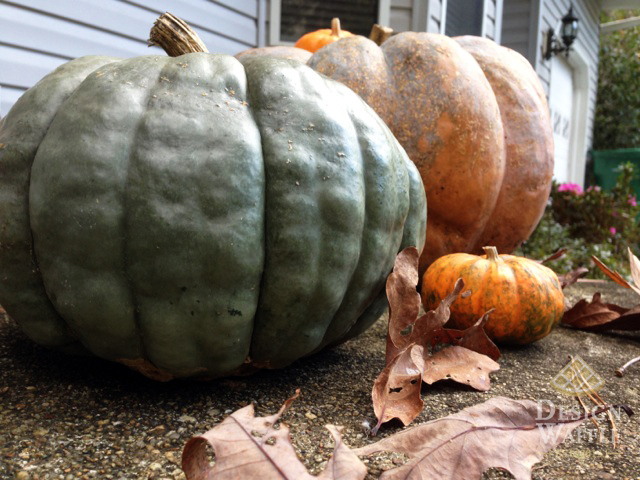 I always have to get a few weird colored pumpkins every year. The bluey-green ones are my favorite. A couple days later, I brought paint over to my Dad’s house and the kids painted their many pumpkins. 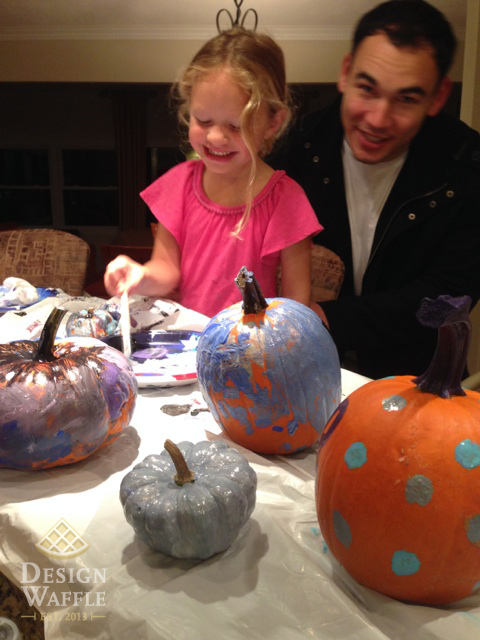 Nathan concentrated on applying what seemed like an entire bottle of paint to one small pumpkin, while Taylor painted multiple colors on the rest of them. No, uncle Travis didn’t paint. He’s the pumpkin grinch. 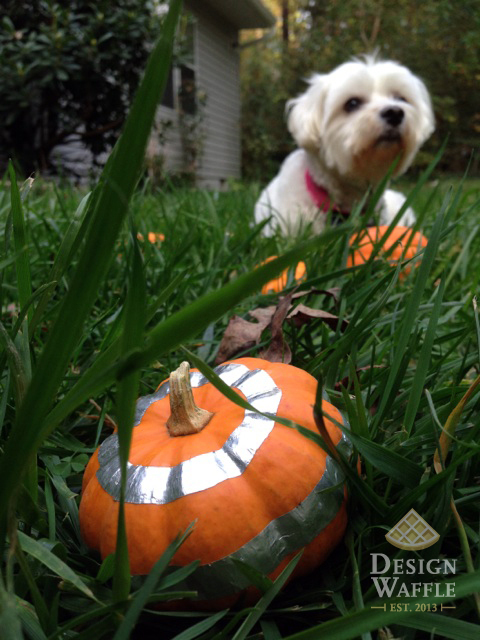 Way too cool to be painting, carving or decorating pumpkins… obviously. He just supervised and tickled. 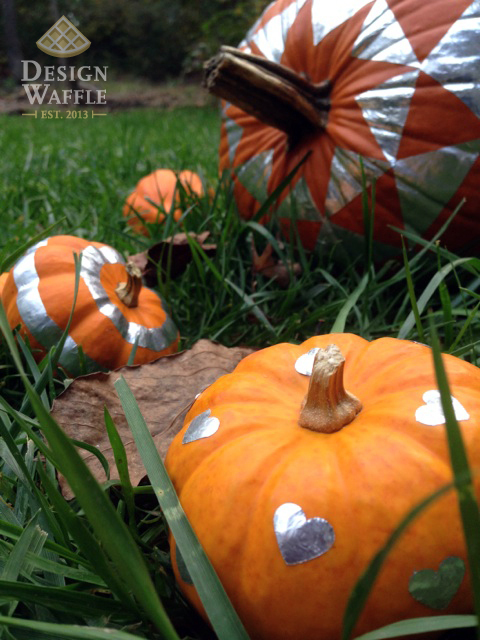 If you’ve done anything new with your pumpkins this year, please share your ideas! 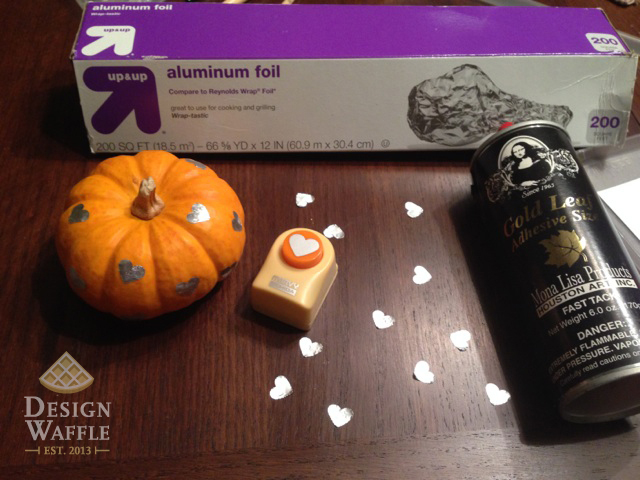 This entry was posted in DIY Projects and tagged Aluminum Foil, Design Waffle, DIY, Halloween, Metallic Pumpkins, Painting. Bookmark the permalink. Thanks! The spray adhesive got a little messy too so be careful with it! My hands were really sticky and it was difficult to remove. Maybe try 3M’s adhesive spray instead of the stuff I used, or brush on the glue.